As a fleet manager you may be responsible for a handful of trucks, or you may be tracking thousands of vehicles spread out across the nation. You might work with a dedicated company fleet, be responsible for monitoring truck status for owner operators under contract to your company, or, quite often, a combination of these possibilities. One things for sure—fleet managers are the people all changes to a truck’s status go through. When you’re dealing with a few hundred vehicles that can get real complicated, real fast. To keep wheels on the highway, you have to be organized, efficient, and motivated. Any changes to vehicle status, weights, suspensions, credits, and truck sales have to be addressed quickly, all while keeping multiple VINs accurate and organized. At 2290Tax, we understand just how complicated a fleet manager’s life can be, especially come tax time. Our fleet manager account is designed to make your job—and by extension, your drivers’ jobs—as efficient as possible. Your job’s difficult enough without having to decipher complex, user-unfriendly software programs and account systems. A 2290Tax fleet management account is intuitive, easy to use, and expedites efiling and the timely delivery of your vehicles’ Stamped Schedule 1 forms. With new information on individual vehicles moving across your desk every day, it’s important to be able to organize and save data quickly. Our system makes it easy to change any detail of a truck’s information with a few quick clicks. You can record changes as soon as they come available, saving them on your account for future use. Once you save the data, it’s there to be used any time you need to submit 2290 tax forms or make additional changes to individual vehicle status. With all data safely stored in your account, you don’t have to reinvent the wheel every time you efile for your fleet. Just update information and you can submit 2290 forms for multiple trucks. As soon as the IRS receives the information, we email you copies of your Stamped Schedule 1s, while receiving a watermarked replacement copy of the documents is only a click or two away. 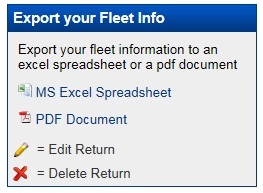 As fleet manager, you may need to share information on the fleet’s status with others. Your 2290Tax account allows you to print off either PDF files or Excel spreadsheets in a matter of minutes. The whole process is simple and effective—but we also know when fleet managers have questions about the system they need answers as soon as possible. Our family-staffed customer support system takes your concerns seriously, and responds to all concerns and questions in a timely manner. Filing 2290 forms for a fleet of trucks can become a logistical nightmare. Let us take the complexity out of the process. Next Next post: Revenue for US Trucking Companies Just Hit $700 billion: Where are the Drivers?